When choosing decor for staging, keep in mind that less is more. You want to have a simple, clean, and organized design that appeals to the majority of potential buyers. The focus of the home should be its best features and not your decor. The aim of staging a home is to show off its potential, so taking out the more personal items is important. That means packing away family photos and opting instead for modern, elegant decor pieces. 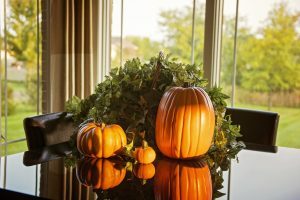 Since the days are growing shorter throughout the fall, it’s important to have adequate lighting inside of the home. Many potential buyers may be looking at the property in the late afternoon and early evening hours, so be sure to keep the interior as light and bright as possible. Remove heavy or dark window coverings and replace them with lightweight curtains. Add lamps and higher wattage bulbs to ensure each room looks as bright as it can be, no matter the time of day. Appeal to buyers by choosing to use the colors of the season. Give the walls a fresh coat of bright, neutral paint. Use accent items with warm, rich colors, such as rugs, throw pillows, and even furniture. For fall, stick with colors like deep oranges, reds, and browns. Add hints of yellow and cream. Bring in the textures of fall with leaves, pumpkins, and other natural elements like acorns and branches. Take advantage of the natural beauty of the autumn months when showing off your home.